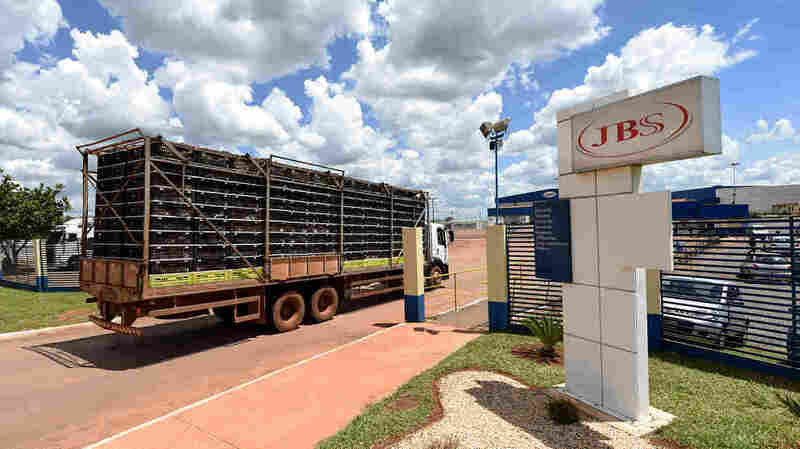 Brazil Levies Record $3.2 Billion Fine On Parent Of Meatpacking Giant : The Two-Way The holding company behind JBS has agreed to pay roughly $3.2 billion to authorities. The plea agreement implicated President Michel Temer in the vast corruption scandal now roiling the country. A truck loaded with chickens arrives at a JBS meat processing plant in Samambaia, Brazil, in March. Brazil's massive, yearslong corruption investigation has reached a historic mile-marker: J&F Investimentos, the holding company behind meatpacking giant JBS SA, agreed to pay roughly $3.2 billion in fines for its involvement in a vast graft scandal that has reached even President Michel Temer. "In absolute terms, the amount is the highest in leniency agreements already signed in Brazil and in the world," Brazilian prosecutors said in a statement Tuesday night, according to Financial Times. The penalty outpaces the one levied against construction conglomerate Odebrecht last year as part of the same investigation. Yet this penalty is just one part of the plea deal; another component played out in a very public way earlier this month, when J&F co-owner Joesley Batista turned over a secret recording to prosecutors. That recording — which appears to show Temer condoning the payment of hush money to an imprisoned politician — leaked to media earlier this month, prompting protests in the streets and questions of whether Temer's tenure could survive the scandal. "I will not resign. I know what I have done," he said recently in a televised speech, as translated by the BBC. "I never authorized any payments for someone to be silent. I did not buy anyone's silence. I fear no accusations." But Temer is not the only politician to be tangled in the tendrils of the probe, known as Operation Car Wash.
Reuters reports Batista and his brother and co-owner, Wesley, testified that they spent 600 million reals — or about $186 million — in bribes for nearly 1,900 politicians in recent years. According to the wire service, that long list includes former presidents Luiz Inacio Lula da Silva and Dilma Rousseff, who was impeached herself last year.